2012's Wreck-It Ralph introduced movie viewers to old school video game villain Ralph (John C. Reilly) and his journey to become a hero (leading to quite a bit of chaos for everyone involved). The sequel opens in much the same way with Ralph's attempt to help his best friend leading to disaster and a trip to the Internet for Ralph and Vanellope (Sarah Silverman) in search of a steering wheel for her video game which is the only thing that can stop the machine from officially being retired from the arcade. Screenwriters Phil Johnston and Pamela Ribon have fun introducing the two characters to the wider world of the Internet including E-bay, Internet videos and memes, a Grand Theft Auto style video game called Slaughter Race, and a chance for Vanellope to learn about a special talent of princesses from those who know it best. The later provides some of the film's best scenes including a musical number I hope gets Oscar consideration. While the story meanders a bit more than the original, there are plenty of big laughs while still delivering a nice message about friendship for a younger audience (and Ralph). While not all that necessary to the plot this time around, several of the characters from Wreck-It Ralph return including Fix-It Felix (Jack McBrayer), Calhoun (Jane Lynch), and the other racers from Sugar Rush. While it's nice to see them again, the movie's near 2-hour running time could have been trimmed with a bit less screentime for those that are only peripherally involved this time around. 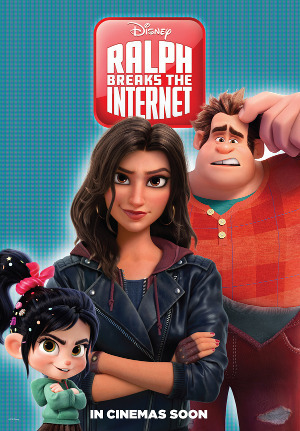 The stand-outs among the new characters are Gal Gadot as a super-cool new racer who gives Vanellope a run for her money, Taraji P. Henson as a social media expert, several actresses reprising their princessly roles, and Alan Tudyk as an informative help desk (who sometimes offers too much information). There are several enjoyable nuggets here including our heroes getting stuck in Tron and the startling result of Ralph's insecurities and struggles with friendship. While younger audiences may miss the film's sly references and more obvious jabs at Internet celebrity, pop-culture, and online games, there's still plenty for kids to enjoy with Ralph and Vanellope finding their way in the strange new world. If you do attend the screening, I'd recommend staying through the first-half of the credits for a bonus scene involving a rabbit and pancakes that, like the rest of the film, is well worth your time.